Deferred income annuities can be a powerful defense against the risk of outliving retirement savings. But how much of a retirement nest egg should be invested in a DIA? And why don’t more consumers purchase a DIA? The Employee Benefit Research Institute looked into DIAs and their adoption by those facing retirement. The researchers found that only a small percentage of defined contribution and individual retirement account balances are annuitized. In addition, a significant percentage of defined benefit funds are taken as lump-sum distributions when the option is available. Because DIA payments are delayed —usually for 20 years — and generally begin paying out when the annuity owner is in their 80s, a DIA could be offered for a small fraction of the cost for a similar monthly benefit provided by a single-premium immediate annuity that begins paying out immediately at retirement, he said. This reduced cost could help alleviate consumers’ reluctance to give up control over a large portion of their retirement account funds at retirement age. In addition, EBRI researchers found that a DIA was more attractive to consumers if it had a death benefit attached to it. 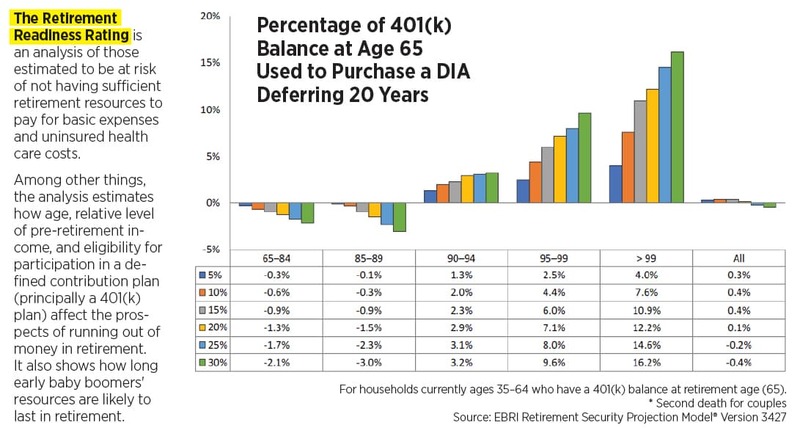 EBRI’s study examined how the probability of a “successful” retirement varies with the percentage of a 401(k) balance that is used to purchase a DIA. A “successful” retirement was measured by the EBRI Retirement Readiness Rating. The rating analyzes the risk of not having enough retirement funds to cover basic expenses and uninsured health care costs. The results were broken down for all households with a 401(k) balance and analyzed by a simulated age of death. EBRI also looked at the results by different age groups. So when is the best time to buy a DIA, and how much of a nest egg should go into it? Buying a DIA without a death benefit at age 65, putting up to 20 percent of a 401(k) account balance into it and deferring payment for 20 years provides the best hedge against outliving income in retirement, VanDerhei said. 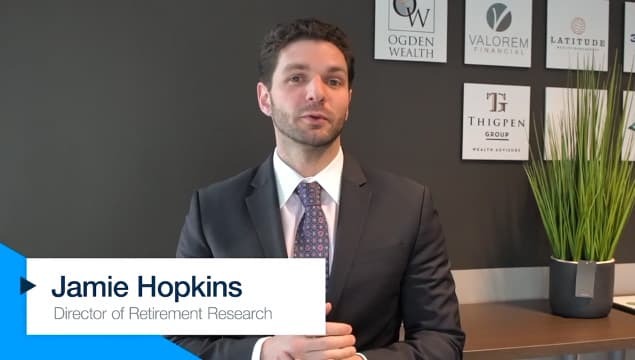 However, more is not exactly better when it comes to how much of a retirement nest egg should be invested in a DIA, VanDerhei cautioned. “There is an overall decrease in retirement readiness for DIA purchases starting at 25 percent — due in part to the interaction with long-term care costs,” he said. The EBRI study found that retirement readiness improves when DIA purchases equal five, 10 or 15 percent of a 401(k) balance and a death benefit is added to the DIA in case the annuity holder dies before the DIA begins paying out. When EBRI ran through scenarios in which the annuity holders were estimated to die at certain ages, retirement readiness decreased for those projected to die before the DIA benefits kicked in, as well as those projected to die soon after the benefits begin. Investors projected to live beyond age 89 showed a significant increase in retirement readiness if they put a larger percentage — but not larger than 25 percent — of their 401(k) balance into a DIA. EBRI’s 2015 Retirement Confidence Survey attempted to gauge workers’ interest in DIAs. Workers were asked how interested they would be at retirement in purchasing an insurance product with a portion of their savings that would begin providing guaranteed monthly income for the rest of the worker’s (or their spouse’s) life at some point in the future, such as age 80 or 85. Eight percent of workers indicated they were very interested and 30 percent reported they were somewhat interested, while 21 percent said they were not too interested and 38 percent said they were not at all interested. EBRI’s research showed that that the level of interest in purchasing a longevity annuity is strongly associated with how strongly the worker believes they will live to age 85. Nearly one-half (47 percent) of those who believed it was “very likely” that they would live until at least age 85 were either somewhat interested or very interested in purchasing such a product; however, this percentage dropped to 41 for those who believed it was “somewhat likely” that they would live until at least age 85. One-quarter (25 percent) of those who believed that they were either “not too likely” or “not at all likely” to live until at least age 85 reported that they were interested in buying such an annuity. A similar relationship was found between the level of interest in purchasing a longevity annuity and a worker’s perceived likelihood of living to age 95. In this case, more than one-half (53 percent) of those who believed it was “very likely” or “somewhat likely” that they would live until at least age 95 were either somewhat interested or very interested in purchasing such a product. This percentage dropped to 35 percent for those who believed it was “not too likely” that they would live until at least age 95 and 30 percent for those who believed that they were “not at all likely” to live until at least age 95. Workers ages 45 or younger — regardless of household income — were much more likely to be interested in purchasing a longevity annuity than their older counterparts. EBRI researchers attributed some of this to public perceptions of the future solvency of Social Security. The percentage of workers ages 45 or younger interested in a longevity annuity was 40 percent for those who believed Social Security would be a major source of income in retirement; however, it increased to 47 percent for those who believed it would be only a minor source of retirement income. The portion of those who expressed interest in a longevity annuity increased to 59 percent for younger workers who believed Social Security will not be a source of income in retirement at all. If purchasing a DIA leads to a higher retirement readiness, then why aren’t more people buying them? DIAs and qualified longevity annuity contracts are a good alternative for those who do not want to put their entire 401(k) balance into a SPIA on retirement, VanDerhei said. VanDerhei began studying DIAs and QLACs in 2015, looking at the ways software programs have been modified to show the relative advantages of these types of annuities over other annuities. But all the number-crunching in the world can’t account for life’s uncertainties, he said. VanDerhei said what most surprised him in conducting the research was that people were interested in seeing the advantages of having a death benefit included in the DIA, so that if the account holder died between the ages of 65 and 84, there would be a return of premium. He said he had a “hunch” that advisors are finding it difficult to sell DIAs and QLACs without a benefit that kicks in if the account holder dies between the ages of 65 and 84. “If you put money into a product that isn’t going to pay out for 20 years and you die within those 20 years, what happens?” he asked. Susan Rupe is managing editor for InsuranceNewsNet. She formerly served as communications director for an insurance agents' association and was an award-winning newspaper reporter and editor. Follow her on Twitter @INNsusan. Contact her at Susan.Rupe@innfeedback.com.